This slightly spicy soup is my favorite squash soup. It’s a bit time consuming for a simple soup but well worth it. I suggest making it one day in advance to allow the flavors to meld. I like to be dress it up with a drizzle of crème fraîche or sour cream that has been loosened with a bit of filtered water and sprinkled with pepitas. The original recipe calls for unpeeled buttercup squash, which is then peeled after cooling, but I usually use peeled butternut squash since it is more common and easy to peel in advance. The cooking times should be altered accordingly. Your squash should be slightly browned when done roasting. William Matthews, “Onions” from Selected Poems and Translations, 1969-1991. 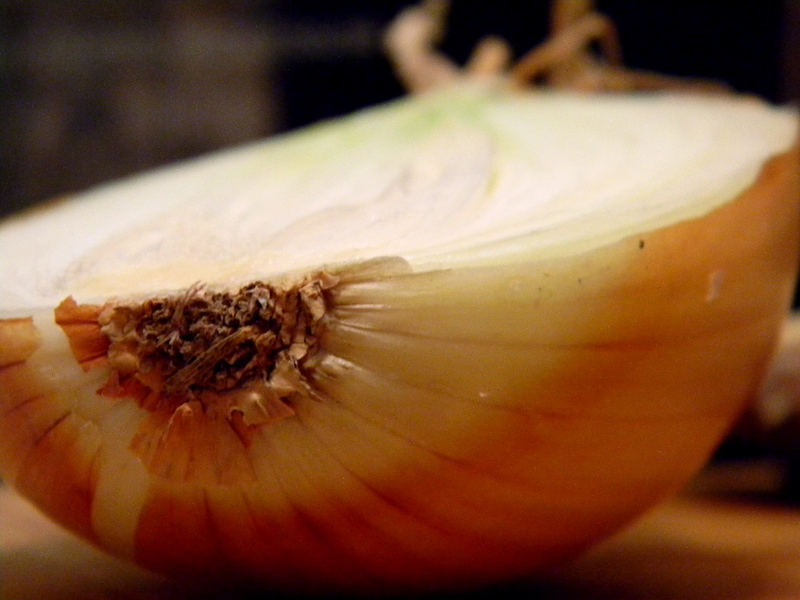 It’s easy to overdo the onion metaphor, but Matthews does it just right in this poem. Something that can never be overdone? Butter and onions. If there’s one thing I’ve learned about cooking from my mom, it’s that everything is made better by first sauteing in butter and onions. In fact, I can’t think of a single recipe that my mom has shared that hasn’t started with, “First, throw a little butter and onions in a pan…” And by a little, she means a half stick of butter and a very large onion. What do onions make you think of? 2) Heat olive oil and add garlic. If you are going to use vegetables, remove the garlic and cook mushrooms, onions and/or peppers. 3) When vegetables are sautéed, add garlic back in and set aside to cool slightly. Combine cooked chicken with garlic and vegetables (or just garlic if you choose not to add vegetables). 4) Drain ravioli and add to chicken, garlic and vegetables. Add tomato sauce, enough to coat everything or as thick as you like. Dish can be warmed in the oven or served at room temperature. Please note: the proportions can be increased or decreased as needed in this dish. For the annual meeting, I used 125 raviolis, one small whole chicken, 6 garlic cloves, 4 onions, 3 red peppers, 1 large package of mushrooms and 1 ½ jars of homemade tomato sauce. Steve Fowler, one of our FDC drivers, and his wife Molly brought this delicious soup to our annual meeting and it was a big hit! Here’s what they said about it: “We store a fair amount of vegetables every winter. This is a recipe I came up with that goes great on a winter day and is easily adapted to what we have on hand – It turns out a little different every time, but is always worth the effort. The following is just a guideline – use what you have. It takes a couple of hours, but is easy, and you can walk away once everything is in the pot. Add to the pot and just cover with water. Bring to boil and turn back to a simmer until tender (about an hour). Use a stick blender to puree (can be done in a food processor or mash for a course texture). Add 1-2 cups cream or half & half. Replacing some of the water with chicken stock or adding a couple handfuls of parmesan will make it a little richer, or if you save your cheese rinds – throw a couple in and remove right before pureeing.